Dollar General is a variety store with different and wide range of products from aisles like cleaning supplies, grocery, pet supplies, toys, health & beauty, clothing, home products etc. You can browse the Dollar General Ad that offers weekly savings on grocery, snacks and other weekly supplies on this page. Subscribe to get these ads on your emails. Digital coupons are also frequently available discounts on the Dollar General Weekly Ads. Online and in-store discounts are promotions in the ads. Instant savings for a certain amount of purchases can also be your source of saving. Circular ads are a good way to save on weekly supplies or other products from the range of Dollar General. The retailer has 15000 stores in 48 states. Dollar General was founded in 1938 in Kentucky. It also has original products like ibuprofen, candies, water bottles etc. Possibly a good deal on these is available on the new Dollar General weekly ad, too. Early Easter sales are everywhere. 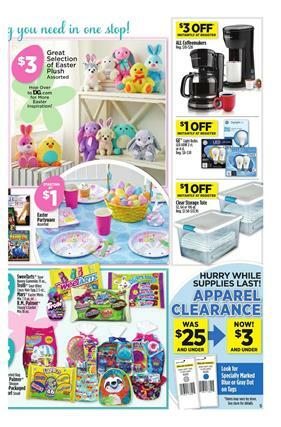 You can find some products of Easter candies, treats, or similar stuff on March 17 - 23 at Dollar General stores. 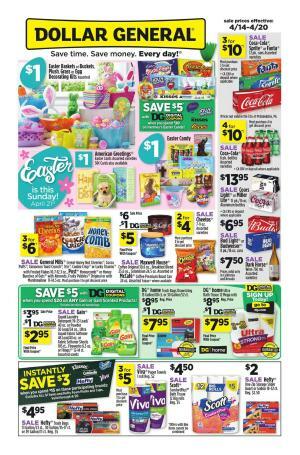 Buy Hershey's, Reese's, Cadbury, and more candies with the 2 for $5 deal on the first page of Dollar General Ad. Favorite snacks and beverage packs are on sale. Cheetos, Dreyer's are both multiple-buy deals. Also, there is a great discount on breakfast foods such as digital coupons on Kellogg's cereal, frosted flakes, raisin bran that are 2 for $4. They will be even cheaper with the coupon matchup. Refresh yourself during the Spring and Summer days when we are dehydrated in hot days. America was so cold in winter and we hope to get a shining sun in the nice warm days of Spring. Nothing beats a quick quench during a sweating summer day. 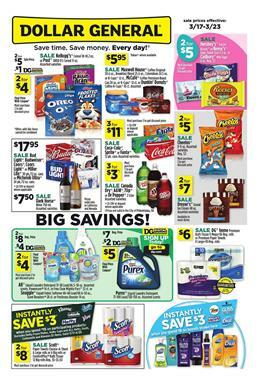 Buy soft drinks to stock up this week at Dollar General Weekly Ad. Canada Dry, A&W, 7UP, Dr Pepper will cost $3 for 3 of them. Coca-Cola, Sprite, or Fanta are 3 for $11! Moreover, the household category of the Dollar General Ad is an important part of it as well. Save $3 instantly when you spend $15 on Hefty, Scott, Cottonelle, and Kleenex $1 items. Their price is 2 for $8. As you might guess, game snacks are popular among the weekly ad readers. Gift cards of Domino's, Burger King, and more are great alternatives who like to have some fast food during their favorite games. Candies of popular brands like twix, Snickers, or others are available on pg 4. Don't miss out these savings and subscribe to get more. These are just examples of the ad deals. Go to the preview page to see all of them.